In other business, the board voted 4-0, with two abstentions, to follow CEO Brandon Clary’s recommendation that the hospital use existing signs, repainting them and inserting the hospital’s new logo, instead of purchasing new signage. This move was noted as being “a fraction of the cost” of a new sign. Also approved in the same vote was a move to purchase a radiology department recommended Nova Rad system to replace the system currently in use which is being phased out. The purchase cost for this was given as $74,472; this was also the lowest among three bids. Concerns were heard from several doctors in regards to the required Electronic Health Records system. These complaints included increased errors as a result of the system, difficulty with order entries, and time consumption. A comment was made regarding concerns over liability issues for the doctors as well as the hospital due to this system which was called “horrible.” The doctors were informed that, unfortunately, these issues are not unique to ECH but are being experienced by most facilities using the system. The doctors were asked, however, to relay any suggestions they might have that might make the system more efficient. 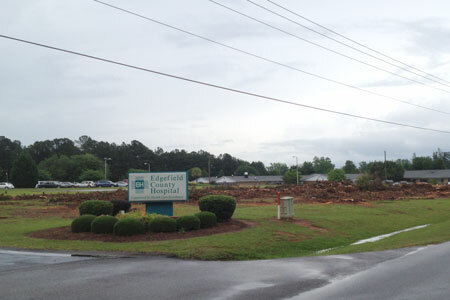 The board voted as one to accept a mutual settlement agreement with the Edgefield Medical Center. In regards to this matter, the board was advised that EMC and the hospital will each be seeking independent appraisals on the property. The two entities will then take those appraisals and negotiate a fair market price for a new lease agreement. The hope is to have this issue resolved by the board’s next meeting. With no new business to discuss, the meeting was adjourned.